January is the season for forecasts and planning: setting dreams and goals for another twelve-month period. 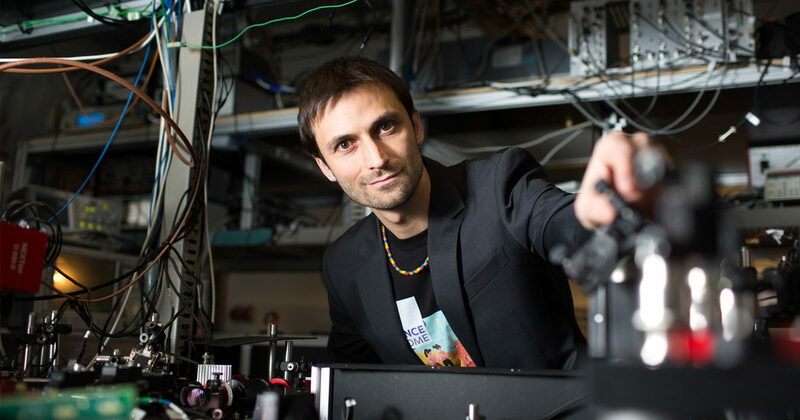 ScienceAtHome group leader, Jacob Sherson spent some time with us to talk about news, global trends and share his view about future developments and ScienceAtHome’s contribution to these advances. The big goal in terms of citizen science is to reach the level of Citizen science+, also called citizen science 2.0 or Extreme Citizen Science. This is reaching true, deep engagement with citizens, bringing them on board throughout the whole research process and helping them to understand what they are doing. For us, as a research group, we aim to upscale our effort in education, data analysis, and the outsourcing of data analysis. Hopefully, StatWorld, one of our new projects, will bring a deeper and more long-term engagement with our community. A big overall goal is re-thinking the way research is conducted in an algorithmic sense. Researchers are basically squeezed from two sides: from the citizen scientists and the algorithms. We would like to introduce hybrid intelligence forms to bring these two closer together. Our project, Quantum Composer is aimed at bringing our powerful algorithms to the fingertips of experts and enthusiasts. The idea is to get the citizens more involved and engaged in the research. To encourage them to not just to spend time, but to spend real ‘quality’ time on Citizen science games. 2018 is going to be the year when ScienceAtHome launches a more systematic effort towards conducting social science behavioral studies in the wild, on a massive scale. It’s what we call a ‘Social Science Supercollider’. The basic principle of that is that all behavioral discoveries ‘from the people’ should be available ‘for the people’, open-source for everyone, and not accumulated by the owners of big, free-to-use online service providers (e.x. Google, Facebook). The mission is to mimic the data acquisition rates of these companies and then share the knowledge in terms of education, products, and interfaces. From a research point of view, the new data protection policy is welcomed and supports our strategy of being open-source and very explicit about what we use data for. It’s a good step towards minimizing the false use of data and being very open about when it is used. AI algorithms have been criticized for being shallow in the sense that they’re not very transferable and they’re data greedy, so in the upcoming year, we would like to set up a much more systematic interface between the citizens and A.I. So far, expert scientists interpreted what the citizens did (for example the gameplay data from Quantum Moves) into algorithms. For autonomously learning algorithms, the mediator step of scientists has to be taken out from the equations. If there is a filter between data and machine learning, like the experts, then we put our own patterns into it and impose those patterns into the algorithmic advances. Connecting the data to machine learning directly would make the process more organic. 2018 is the year when big data and A.I. can create real contributions because companies finally have gone through initial trials and started to align their data sets with the learning capabilities of the algorithms to produce real advances. It has already been in the annual reviews but deep learning is yet to make a huge impact. 2018 is predicted to be the year when it really arrives. For us, hopefully, it’s the year when we’ll start to see the alignment of data creation with what needs to go into the algorithms. It’s not a trivial problem, we don’t know exactly how to do it, but like many companies and other research organizations around the world, we’ll be working on making it happen. We will also apply insights from our “Social Science Supercollider” to question the A.I. paradigm of big data crunching and pursue future human inspired algorithms based on lean, smart data. We want to take advantage of the current state of A.I. and the unique data source system that ScienceAtHome has developed. This can really be a lighthouse project because the Citizen science and natural science problems we encounter are highly complex and mathematically well defined and modelable. This means that afterwards we can look at the process and data and really say what was going on when people had a new idea or a new solution and we can start to interrogate the path to that result. This is what Quantum Minds is all about: to complete a level, it has to be completed three times in a row, so one lucky solution is not enough. We look at the data of each player and then we stop it when they “learn it” (passed the level). We then cut this path in half and look at the solution patterns. Some people eventually learn how to solve the problems and others don’t. We are looking for patterns in the initial data that will predict if the person will learn something in the future. We are searching for a mathematically modelable system to allow us to study this in a way that is difficult to do outside in a wild world setting. We already supply interfaces to close the gap between scientists and citizens: the Alice Challenge and Quantum Composer interfaces are doing exactly that. The next step is making the development of the algorithms more organic to eventually transfer data directly from the citizens to the A.I. That’s the big mission for 2018. Thank you for your much-needed help in 2017. According to Jacob’s forecasts, we need your help even more in 2018 when players’ data can find a more organic way towards A.I. Within the Social Science Supercollider initial steps, you can play Alien Game—a single person behavioral game, Quantum Minds—the study of learning, and a lot more to be expected this year! If you’re more interested in Natural Science, try out our newest game, Turbulence! We’re introducing a new set of filaments later this year. In the field of education, Potential Penguin is available on Windows or Mac and coming to mobile devices soon. If you have a deeper interest in physics, you can try the alpha version of Quantum Composer. Embrace your inner physicist and design your own experiment!